Sorry last month's box wasn't featured due to me being ill, posts were a myth last month! Popping the seal of this bag, I instantly thought..Chinese! Ten Acre Crisps 'The Day Sweet and Sour Became Friends' was orient express moreish! It's not overbearing in taste or smell, the smell is delicate and pleasing. The hand cooked crisps has a good crunch and eating this entire bag doesn't make me feel bad! Just plain old water is becoming a thing of the past, I still love it. I also enjoy fruit infused water, I don't drink it as much because everything is an effort to me as of late. Coconut water, was the new water and then since around a year ago, health blogs were starting to mention maple water. In this months box there's a 250ml carton of DRINKmaple Pure Organic Maple Water. It's 100% organic directly from maple trees in North America. There's no additives - completely pure!! It's lower in sugar than coconut water, fewer electrolytes. The most interesting part of Maple Water is that it contains abscisic acid (ABA), this is a compound used by plants to help them when adapting to stress. In humans it helps to move sugar out of the blood street and stimulate the immune function. Madagascan vanilla marshmallow coated in dark Belgium chocolate and dipped into sugar sprinkles sourced from India Tree, USA is what makes the Ananda Foods Chocolate Marshmallow Lolly. The India Tree sprinkles are chosen due to the fact they are coloured using only vegetable colourants - nothing else (nasties free). Ananda Foods really go the extra mile to make sure their treats are the finest and guilty pleasure free! 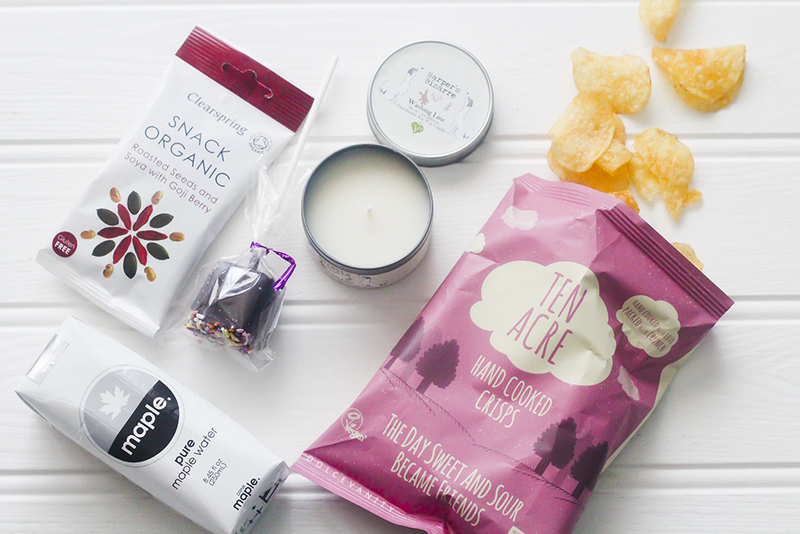 Pop Clearspring Roasted Seeds and Soya w/ Goji Berry into a lunchbox or handbag for a mid morning or afternoon snack. The packet has a mix of Austrian grown soya beans, roasted Styrian pumpkin seeds and extra large goji berries. The East's best hidden secret, goji berries. They've been said to boost the immune system and brain activity, protect against heart disease and cancer, and improve life expectancy while being full of Vitamin C, vitamin B2, vitamin, iron and several antioxidants. Happy days to see a Harpers Candle in the box. After first being introduced to them last year I wrote about my future candle purchases from the company and anytime people smell the candles, they too want one! The one I was sent is the Harpers Bizarre Washing Line Candle sniffing this it leaves me having daydreams of being in a laundry detergant commercial. If there's anything that instantly makes you think of fresh linen and clothes - It's this candle.